In mid-May, the Senate Homeland Security and Governmental Affairs Committee is scheduled to consider the Regulatory Accountability Act, or RAA, a dangerous piece of legislation that will make it harder—if not impossible—for federal agencies to do their jobs to protect consumers from unscrupulous business practices; protect the environment from pollution; and protect public health from exposure to toxic chemicals and unsafe food. Although the Senate sponsors are working to position the bill as moderate relative to its House companion, it is far from reasonable and will open new doors for powerful corporations to block federal agencies trying to serve the public interest. During the first three months of 2017, most of the largest trade associations in the country walked the halls of Congress pushing for the RAA. This speaks volumes about who would stand to benefit from the bill’s passage. From the day that President Donald Trump took office, he has pursued a radical agenda based on a false premise: that federal protections for consumers, workers, the environment, and public health are too burdensome to industry to justify the significant benefits to Americans. 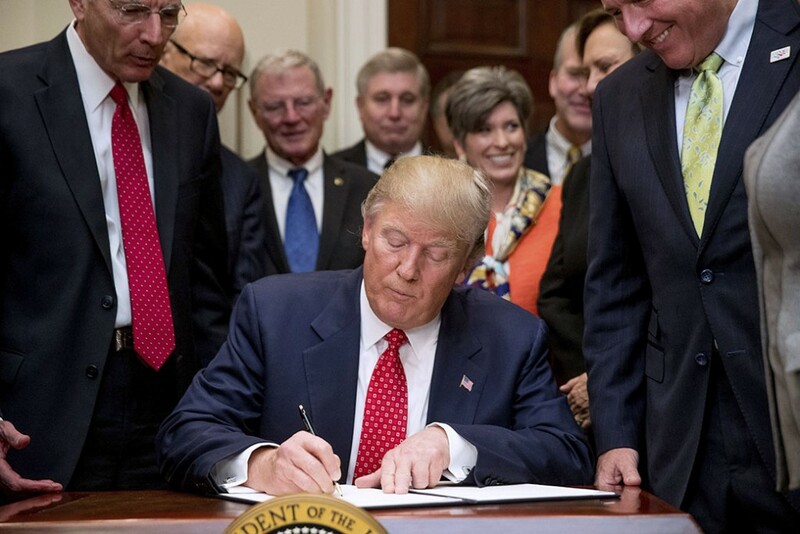 He has issued executive orders and signed congressional resolutions to unravel former President Barack Obama’s signature policies on everything from firearms background checks to student loan repayments to climate change. Congress is working hand in hand with President Trump to implement this agenda. The latest threat to public interest safeguards is the Senate version of the Regulatory Accountability Act. This bill is a pernicious assault on public health and safety cloaked in vague language about arcane procedures and assessments, which is what makes it so dangerous. One’s eyes can glaze over when reading the 58-page bill, but the bill’s effects are alarming: It would shut down any efforts by federal agencies—such as the Federal Aviation Administration, the Food and Drug Administration, or the Environmental Protection Agency—to issue new safeguards that industry dislikes. Among its most egregious provisions, the RAA sets an impossibly high burden of proof that agencies would have to meet before finalizing and implementing a new rule, such as a new air quality or food safety standard. The bill also requires agencies to conduct several rounds of cost-benefit analyses that give more weight to the compliance costs to industry than the benefits to Americans. Taken together, these provisions and others in the bill could lead to total gridlock in the agencies charged with protecting the food we eat, the water we drink, and the air we breathe; ensuring that products are safe before they enter the market; and reining in the worst financial market abuses. If this bill were to become law, the biggest winners would be the powerful corporations that have lobbied to pass it. Tellingly, the RAA does not refer to small businesses once. On February 6, 2017, more than 600 trade associations and business groups sent a letter to Senate Majority Leader Mitch McConnell (R-KY) and Senate Minority Leader Chuck Schumer (D-NY) calling for the Senate to “consider and pass” the RAA. The signatories are a who’s who of the largest and most politically powerful corporations in every sector of the economy, including the Financial Services Roundtable, the American Fuel & Petrochemical Manufacturers, the National Association of Manufacturers, the National Mining Association, and others. They called this bill “a once-in-a-generation opportunity” to change how federal agencies set and enforce rules governing their members’ business activities. Most federal agencies have the basic tools they need to protect Americans from corporations that, by design, prioritize their bottom lines over the common good. Of course, there is always room for improvement. Agencies need adequate funding to conduct stakeholder outreach; conduct the necessary scientific and technical analyses; and, above all, enforce the rules. Fair yet tough enforcement is key to ensuring that the rules on the books make a meaningful difference in people’s lives. Instead of looking for ways to make agencies’ jobs harder, lawmakers should focus their efforts on providing agencies the funds they need and identifying ways to make the regulatory process more transparent, more participatory, and less captured by powerful special interests. The authors searched lobbying disclosure data for the first three months of 2017 for all registrants who lobbied on the Regulatory Accountability Act. The authors determined which of those registrants lobbied in support of the RAA by reviewing the lobbying disclosure forms; letters of support for the Senate or House versions of the bill; and a search of press releases, public comments, and official statements made by the companies and associations or their representatives. If a corporation reported lobbying on the RAA but did not indicate a position, the authors assumed that it supports the RAA if it is a member of a trade association that has lobbied for the RAA in this time period. The authors did not include a company or trade association in this analysis if they could not otherwise ascertain the entity’s position on the legislation. Alison Cassady is the Director of Domestic Energy and Environment Policy at the Center for American Progress. Myriam Alexander-Kearns is a Policy Analyst for the Energy and Environment Policy team at the Center.